Today is the first day of the Fort Lauderdale International Boat Show... so if you want to go to a boat show this weekend, you're going to have to head to south Florida. There is plenty happening at this year's show, with the boating industry hoping for a recovery sometime in the near future. This year's event boasts approximately 1,000 vessels on display, from personal watercraft to super yachts over 280 feet - including at least 120 vessels over 100 feet long. Keep reading for free ticket and other discount offers and tips for navigating the show. This time of year, virtually every boating website offers up tips and checklists for winterizing your boat. 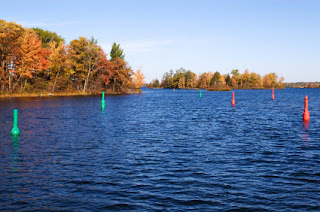 We even posted an article ourselves last week, with plenty of advice for readying your boat for its hibernation season. But let’s face it. There is a group of us boat owners that leave the engines to professional marine mechanics (or perhaps even to a handy hubby if we’ve got one.) We don’t like to get our hands dirty and we don’t want to mess anything up. What we worry about is making sure the interior of the boat is prepped properly so that it doesn’t smell like spoiled milk when returning to launch in the spring, and that the boat is completely cleaned of important valuables so that nobody has to venture to the boat in four feet of snow to fetch a toddler’s favorite toy. If this sounds like you (and for the record, it sounds like this Daily Boater editor), then the winterizing tips from the Boater Life blog were written just for you. 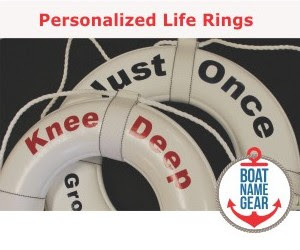 Are you intrigued by the idea of sharing the costs of owning a boat with a few friends or family members without paying fees to a big time-share-like company, and without joining a club? Before you do, you should be aware that sharing a boat with friends is not always smooth sailing. Disputes over scheduling, maintenance, and most of all – money – can ruin a friendship. Disasters can happen. 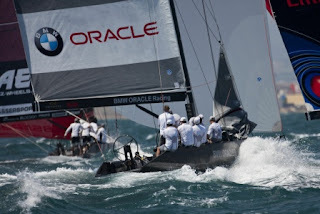 Companies such as Sailtime and Windpath (both of which we have reviewed here previously) exist because there are these risks involved with shared boat ownership, even though the cost savings could be tremendous. 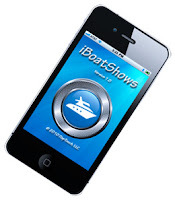 The latest iPhone apps that we have come across are very narrow in their functionality compared to some of the more comprehensive apps that we reviewed in previous posts such as Boating Suite and BoatLoad. But that laser-like focus on just one function is exactly what makes the more recent apps stand out – and easy to remember what to use them for. 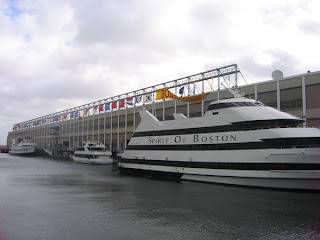 Okay, okay, Boston has been on our mind since we attended the Boston Fall Boat Show a couple of weeks ago. 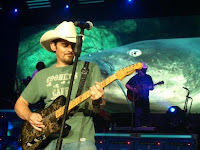 In fact, hey, here are some pics from the show, courtesy of BoatNameGear.com. But when we mentioned in a post last week that we thought the city of Boston had just TWO theme songs, several readers gently reminded us about a song that you have definitely heard if you've watched any Boston sporting event over the past few years, or if you've seen the movie The Departed. In fact, Conan O'Brien calls this band the heart and soul of the Boston music scene. 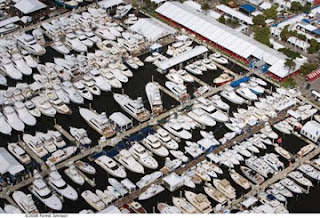 It's a quiet weekend for boat shows as the marine industry prepares for Fort Lauderdale. With boat exhibitors just coming off the huge back-to-back United States Sail and Powerboat Shows in Annapolis, and the Fort Lauderdale International Boat Show® commencing next Thursday, it's no surprise there are not any boat shows happening in the US this weekend. The industry need a breather. Even outside the US there is only one boat show this weekend that we're aware of - and it's in Istanbul. So, if you're in Turkey between now and Sunday, you should check out this show. You can find links to the official websites, maps, and more for these and other upcoming nautical events on our calendar of boat shows. This past weekend, many of us in the US were hauling our boats out of the water, winterizing them, and getting used to the fact that boating is not an option until spring of 2011. 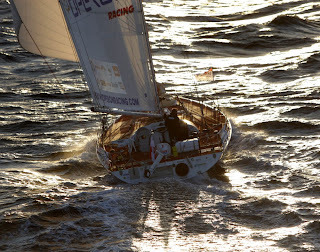 Meanwhile, across the pond on this cool October weekend, five skippers from around the world– each on their own 60-ft sailboat - set off on an ocean race that will keep them on the water until May of 2011... if they're lucky. It's quite a week for boat shows around the world with one of the biggest happening close to our home on the east coast of the USA. 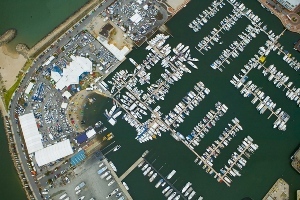 The United States Sailboat Show came to a close a few days ago in Annapolis, Maryland, but its partner-show, the United States Powerboat Show, begins today in the same space. This is a huge show - in fact the show's website claims that it is "the nation’s oldest and largest in-water powerboat exhibition." If you are planning to attend, you might want to wait until Saturday or Sunday... Maryland is expecting a rainy start, but show-goers should enjoy some beautiful weather later in the weekend (check the Annapolis forecast). Sure, you've heard of a shrimp boat, but how about a boat made out of chocolate or wine corks? With last month's news of what may have been the sweetest boat ever built - a recreational vessel made entirely out of chocolate - we started thinking about what other boats have been made out of edible products over the years. 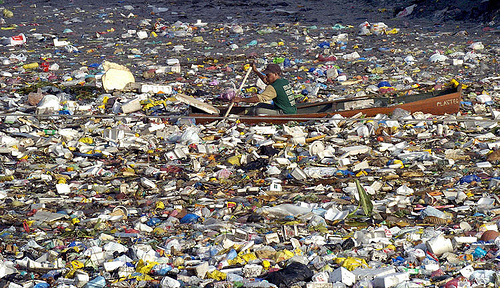 It turns out that there were several boats made out of either food or food and beverage containers over the years. In fact, there were so many that we were able to come up with a top ten list! 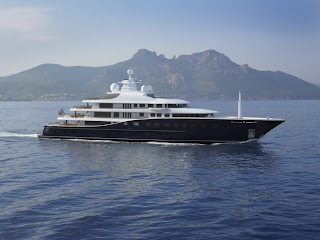 Amazingly, many of the boats that made our list were on the water within just the past few months. This summer, a French chocolatier created a boat made entirely of chocolate and sugar – 1.2 tons of chocolate and sugar to be exact. 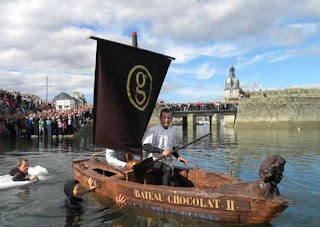 The successful second attempt at a chocolate boat (the first one crumbled to pieces upon launch) was named “Bateau Chocolat II” (French for Chocolate Boat II). Although the chocolate boat had a bit of a rocky start, it eventually sailed for over an hour. The chocolatier now intends to create a 12 meter-long yacht made of 6 to 8 tons of chocolate sometime in 2012.
Who would have thought that boat pumpkins are so popular that the "International Pumpkin Boat Championships" recently took place for a second time in Germany? A tradition that started in the U.S., pumpkin boats and pumpkin boat regattas like the Annual Damariscotta Pumpkinfest and Regatta in Maine can be found almost anywhere… that is, anywhere monster pumpkin patches are close to water! We've learned a lot in the past 500 years, and so much is still unknown. Ever see someone sing a ballad while crowd surfing without missing a beat? Today's Sea Song of the Week is The River by Garth Brooks... and we found a performance on the Daily Motion where Garth appears to do just that. If you're new to Garth Brooks (like we were until recently), make sure you check out his official site (garthbrooks.com) to learn more about his enormous discography, buy some garth gear, and get tickets to one of his post-retirement shows in Vegas. Got suggestions for future Sea Songs? Anything with a hint of a nautical nature will do. Please post your ideas at DailyBoater.com. If you are interested in boat shows, you probably already know about the United States Sailboat Show, which starts today in Annapolis. It's a huge boat show, and is followed by the United States Powerboat Show next week in the same location. In fact, it's such a big show, it looks like nobody else in the entire country even attempted to hold a show at the same time. 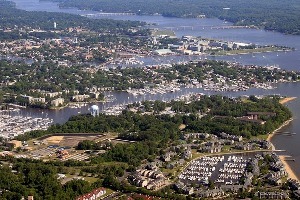 However, Annapolis is not scaring organizers overseas from holding boat shows. 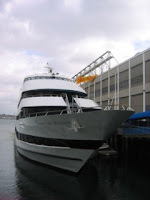 The week-long 50th Genoa International Boat Show, which started last Saturday and was hampered by some serious weather earlier this week, is still going strong through this Sunday (10/10/10. Yes, we said 10/10/10). Down Under, there are two shows going on this weekend. The Club Marine Mandurah Boat Show (pictured) is Friday through Sunday in Western Australia, and the inaugural Ballina Boat and Leisure Show runs Saturday and Sunday in New South Wales. 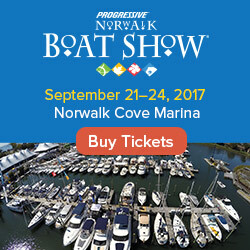 You can find links to the show websites, maps, and more for each of these and other upcoming shows on the FirstBoat.com boat show calendar. When something goes horribly wrong and one of your boat’s passengers goes overboard, aiming a bazooka at them and squeezing the trigger is not likely to be your first reaction. 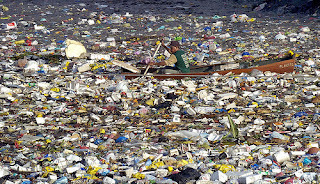 But it just might save their life if the “bazooka” in question is the Longreach Buoyancy Deployment System. Check out this video to see the Longreach in action. 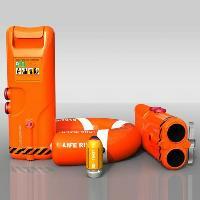 Do you think this could save lives in the US? Share your thoughts please. Boating in Texas just got a little more dangerous after an American tourist was shot in the back of the head on Falcon Lake last week. The victim and his wife were riding PWCs on Falcon Lake - a dammed section of the Rio Grande that straddles the border of the US and Mexico that is popular with water skiers and fishermen – when they were ambushed by armed boaters on the Mexico side. The couple had ridden over to Mexico to see a famous church in Old Guerrero. There are no fences or gates in the water, just markers where the boundary lies between the two countries. 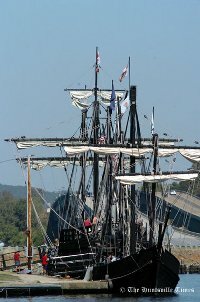 There had been previous run-ins with pirates on this body of water, but this is the first known case of someone being hurt or killed. In an article about the incident in the Associated Press, a Texas Parks and Wildlife Department spokesman stated, in what may be a bit of an understatement, "I would think that, right now, the prudent boater would want to stay on the Texas side." We're live in Boston today at the Boston Fall Boat Show, and we've got pictures to prove it. Note the yellow 'Boat Show' sign blowing in the very blustery wind - what a day! Anyway, since we're in Boston, what better nautical tune could we have picked than Dirty Water, originally done by the Standells? That's what we thought! So for our Sea Song of the Week we picked a live version of Dirty Water performed last year at Fenway by the Dave Matthews Band.